Gustbuster Classic Umbrellas | Gust Buster 48" Arc Canopy Umbrella FREE SHIPPING! 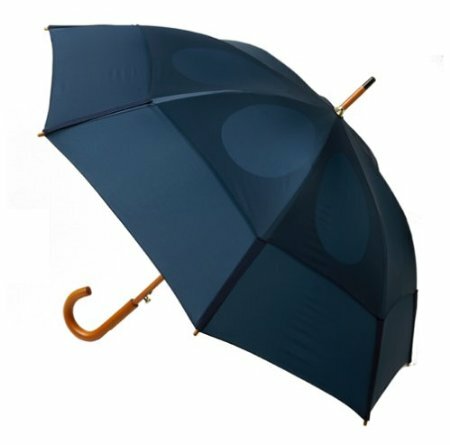 The Gustbuster Classic Umbrella is a fashionably styled umbrella that features a traditional hook handle. This umbrella keeps you dry by opening to a generous 48 inch wingspan, yet is light enough to hook the elegant wood handle over your arm or handbag comfortably. This Gustbuster umbrella features the patented tear-drop canopy design allowing the umbrella to scoff at even 50 m.p.h. + winds. Since the upper canopy is connected by Gustbuster's patented elastic straps, you can bet this umbrella won't turn inside out, or ever leak! The sturdy fiberglass and rubberized poly-frame mean the Gustbuster Classic Umbrella will not flip, flap, or rust. This Classic umbrella is covered by Gustbuster's Lifetime replacement or repair guarantee! Select the style and color that fits you below. Don’t miss the rest of our Umbrellas! We specialize in logoed Gustbuster umbrellas for your corporate event, or tournament gift. Call toll free 1-888-667-0553 for your free, no obligation custom quote! Learn More Here! SAVE on 3 or more Gustbuster Classic umbrellas! FREE SHIPPING! Gustbuster Sunbuster Sunblock UV Blocking Sun Umbrella 58"
*Contiguous 48 United States ONLY. AK, HI, APO/FPO may have additional shipping and will not be guaranteed for Dec 24th Delivery. Free Shipping EVERY item EVERY day! applies to ground shipping to the Contiguous 48 United States ONLY. Shipments to AK, HI, and some shipments to APO/FPO, and International destinations are charged according to weight. To qualify for free shipping, address(es) that are BOTH US Postal service AND UPS/Fedex deliverable must be supplied. Expedited shipments are extra, and charged by weight.